Thank you to Ray Farris ’62 for participating in this Q&A. Why did you join Phi Delt as an undergraduate? I liked the members, particularly their good blend of enjoying themselves and doing well academically. What is the funniest memory from your Phi Delt days? Tom Wingfield ‘61 reading minutes of the Chapter meetings. He ended up being a doctor when he should have been a humorist. What is the single fondest memory you have shared/will share with your children and grandchildren? The Christmas party where creative gifts were given to our dates. Have you visited Chapel Hill graduation? Yes, on occasion of class reunions. This year we have our 50th Reunion and we will gather the ’62 Phi Delts. What about your membership in Phi Delt makes you the most proud? I’m proud of the character of the members. Did you meet your spouse or partner because of Phi Delt? No, but it was close. We had many mutual friends. Do you have any Spring Break or road trip stories with your brothers? We went to a beach for Spring Break three times and road tripped to California once. 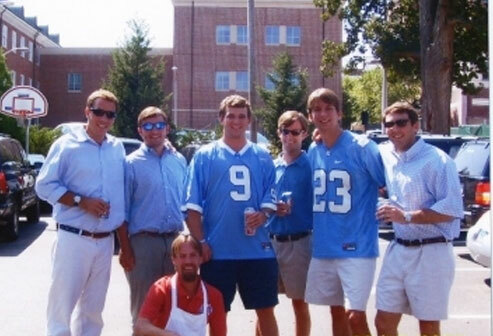 Share a story of a recent reunion or plans for an upcoming one with your Phi Delt brothers. We are currently working on our 50th Reunion and Bob Bilbro ‘62 is heading up the effort to convene the the Phi Delts at a specific gathering. What was your favorite part about Spring Semester? Beach weekend. What was your fraternity nickname and how did you get it? Are you still called that today? Some people called me Rip or Ripper. How would your life be different today if you had never joined Phi Delt? I am not certain, but it would have been difficult to have better blended the qualities I think are important in any other place. Where has life taken you since graduation? What's new in your life today? I am happily married to Cydne Wright (class of 1965) and we have two children and six grandchildren, all of whom love Carolina, or when they are older, will love Carolina. I practice law and have remain interested in University affairs. Why would you encourage other brothers to engage with Phi Delt in their alumni years? The synergy of brothers visiting with one another whenever and wherever is always a good feeling for me.